Only 7,108 miles with Full Dealer Service History. Painted in Porsche GT Silver Metallic with Contrasting Yarwood Black Leather with Red Piping and Embroidered Headrests. 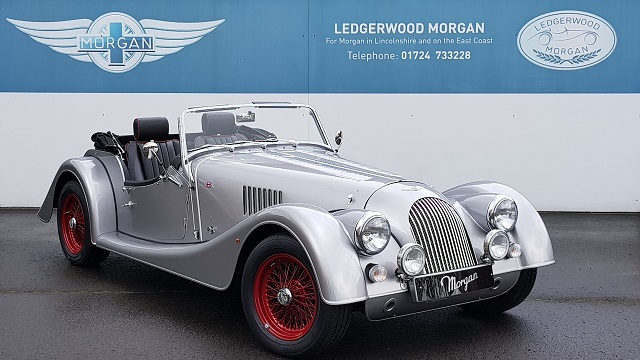 A super looking Plus 4 in Fantastic condition thoroughly cherished and enjoyed by the last owner, who is only parting with car for a new model. A great list of extras are fitted to this car lifting it above the norm, and making a superb car for the next owner to cherish. Please contact us directly for any help or information you may need. Only 7,108 miles with Full Dealer History. Painted in Porsche GT Metallic Silver with Yarwood Black Leather Piped in Red with Embroidered Headrests. 5 x Red Painted Wire Wheels, Stone Guard, Silver Mesh Grille. Rear Over Riders, Clear Lenses all round, Round Door mirrors, Union Jack Badges. Driving Lamps, Front Air Dam. Heated Seats, Elasticated Door Pockets, Radio Cd, Clock, Sun Visors. Stainless Steel Door Check Straps, Stainless Steel Chassis Rail Covers, Stainless Steel Rear View Mirror.